An elderly Sandwich man's car, which was so full of trash and other random items that the rear and side windows and half of the windshield were completely covered, was impounded in Yarmouth yesterday morning, police said. Police said that Theodore Clements was pulled over in his Nissan Stanza when police noticed the blocked windows. Searching the car, they found an assortment of items, including a cast iron chain and hook, a bike, hockey helmets, and empty food boxes. Clements told police he had a diagnosed hoarding condition. The car, which was unregistered and had not been inspected since March 2005, was towed, police said, and Clements was issued a citation and taken home to a senior housing complex. Hoarding condition. Yeah, yeah, that's it. I have a hoarding condition. A biological explanation for my behavior! I'm not a pack rat. I have a medical condition. Let's close the prisons and provide all criminals with medical treatment instead. Someone out there has a murder condition. Actually, someone out there has a stupid condition. I was listening to the radio and I couldn't believe what I was hearing. Literally. A behavioral psychologist had given a name to what years ago used to be called "rebellion." It is now called "Oppositional Defiant Disorder." So now there is another medical explanation for one more type of bad behavior. This is what happens when we assume that we are nothing but molecules in motion. No one is responsible for his or her behavior. And if one of these kids commits a crime......well, we certainly can't punish someone for being sick, can we? 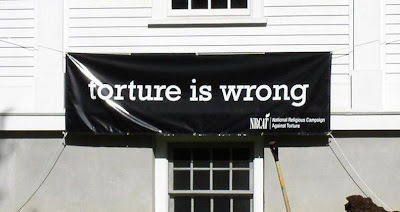 I found this banner outside a Unitarian Universalist church I pass on my way to work. The sign is a logical contradiction. I'm tempted to stop by and ask them if they have room for beliefs that don't have room for different beliefs! "We are a welcoming faith, " says Rev. Jim Eller, a UU Pastor. "We do not have one set of beliefs....We welcome agnostics, atheists, humanists, pagans, Buddhists, Christians and theists. All are welcome." Oh? Would they welcome Nazis? Would they welcome racists? Child abusers? Biblical Fundamentalists? No, especially not Biblical Fundamentalists. Sadly, this sign is typical of today's thinking. Or, should I say non-thinking? I love puzzles, brainteasers, logic riddles, and paradoxes. Here's an interesting paradox. How many of the following five statements are false? Three of these five statements are false. You may have seen this bumper sticker in your travels. I found this one in the parking lot where I work, though I have no idea whose it is. If I find out, I'll probably ask them about it. The message is a call to rebellion against the current mode of thinking, whatever it happens to be. Maybe some people display the bumper sticker to be funny or to raise eyebrows, but I'm sure some consider it a serious expression of their own thinking. 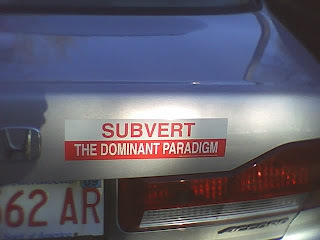 My question to them is what will you do when the dominant paradigm becomes subverting the dominant paradigm? This reminds me of a quote by G.K. Chesterton in his book, "Orthodoxy." It's a keen observation about modern man, summed up brilliantly in the last sentence. I grew up calling soft drinks "pop." But when I moved to New England, I realized that hardly anyone knew what pop was. Instead, virtually everyone calls it "soda," and a few even call it "tonic." 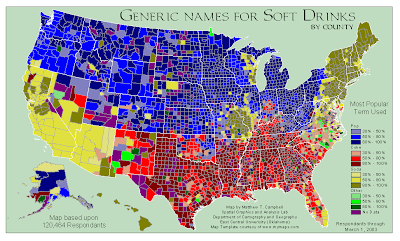 Here's a fascinating map that shows, county by county, the most common term for soft drinks.